Paper summary mashayekhi https://i.imgur.com/mYFkCxk.png Main contributions: The paper proposed a new method to provide large scale supervised reading comprehension and also developing attention based deep neural networks that can answer complex questions from real documents. Importance: Obtaining supervised natural language comprehensive data in large scale is difficult. On the other hand, reading comprehension methods constructed based on synthetic data failed in real environment when facing real data. This work addresses lack of real supervised reading comprehension data. 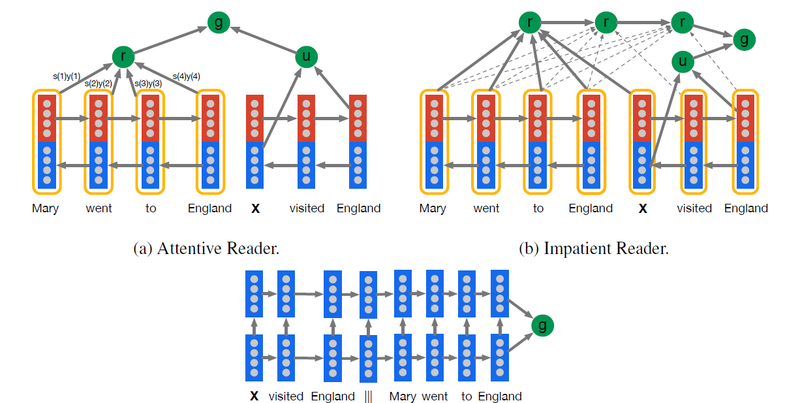 In addition, they build novel deep learning models for reading comprehension by incorporating attention mechanism into recurrent neural networks. Attention mechanism allows a model to focus on the parts of a document that it believes will help it answer a question. Method: First part, two machine reading corpora is created by exploiting CNN and Daily Mail articles along with their corresponding summaries in form of the bullet points. These bullet points are abstractive and they are paraphrasing important parts of the article rather than copying sentences from the text. The bullet points turn into Cloze type questions by replacing one entity at a time with an entity marker, for example, “producer X will not press charges against ent212 ,his lawyer says.”. All the entities are replaced by entity markers and using a coreference and also entity markers are permuted for each data points to avoid world knowledge and co-occurrence effects in the reading comprehension. Second part, For the reading comprehension task, they used 2 simple base line models(A), 2 symbolic matching models(B), and 4 recurrent neural networks models(C): A1) Majority Baseline: It picks the most frequently observed entity in the context document. A2) Exclusive Majority: It picks the most frequently observed entity in the context document which is not observed in the query. B1) Frame-Semantic Parsing: This method parses the sentence to find "who did what to whom" using state-of-the-art frame semantic parser on the anonymized data points. B2) Word Distance Benchmark: It aligns placeholder of Cloze form questions with each possible entity in the context document and calculates the distance between the question and the context around the aligned entity. Then sum of the distance of every word in a query to their nearest aligned word in the document is calculated. C1) Deep LSTM Reader (2-layer LSTM) This model feeds the [document | query] pair separated by a delimiter as a single large document, one word at a time. LSTM cells have skip connections from input to hidden layers and hidden layer to output. C2) Attentive Reader (bi-directional LSTM with attention) This model employs attention mechanism to overcome the bottleneck of fixed width hidden vector. First, it encodes the document and the query using separate bi-directional single layer LSTM. Then, query encoding is obtained by concatenating the final forward and backwards outputs. Document encoding is obtained by a weighted sum of output vectors (obtained by concatenating the forward and backwards outputs). The weights can be interpreted as the degree to which the network attends to a particular token in the document. Finally, the model is completed by defining a non-linear combination of document and query embedding. C3) Uniform Reader (bi-directional LSTM) It is Attentive Reader without attention mechanism, which is used here to see the effect of attention mechanism on the results. C4) Impatient Reader (bi-directional LSTM with attention per each query token) This one is similar to Attentive Reader except that the attention weights are computed per each query token. The intuition is that for each token the model finds which part of the context document is more relevant. The model accumulates the information from the document as each query token is seen and finally outputs a joint document query representation using a non-linear combination of document embedding and query embedding. Results: As expected, Attentive and Impatient Readers outperform all other models which show the benefits of attention model. Also Uniform Reader supports this hypothesis. The accuracies on two datasets (CNN, Daily Mail) are Maximum Frequency: 33.2 / 25.5, Exclusive Frequency: 39.3 / 32.8, Frame-semantic model: 40.2 / 35.5, Word distance model: 50.9 / 55.5, Deep LSTM Reader: 57.0 / 62.2, Uniform Reader: 39.4 / 34.4, Attentive Reader: 63.0 / 69.0, Impatient Reader: 63.8 / 68.0. This paper explores the problem of question answering based on natural text. While this has been explored recently in the context of Memory Networks, the problems tackled so far have been synthetically generated. In this paper, the authors propose to extract from news sites more realistic question answering examples, by treating the main body of a news article as the content (the "facts") and extracting questions from the article's bullet point summaries. Specifically, by detecting the entities in these bullet points and replacing them with a question place older (e.g. "Producer X will not press charges"), they are able to generate queries which, while grammatically not being questions, do require to perform a form of question answering. Thanks to this procedure, two large *supervised* datasets are created, with several thousands of questions, based on the CNN and Daily Mail news sites. Then, the authors investigate neural network based systems for solving this task. They consider a fairly simple Deep LSTM network, which is first fed the article's content and then the query. They also consider two architectures that incorporate an attentional mechanism, based on softmax weighting. The first ("Attentive Reader") attends once in the document (i.e. uses a single softmax weight vector) while the second ("Impatient Reader") attends after every word in the query (akin to the soft attention architecture in the "Show Attend and Tell" paper). These neural network architectures are also compared with simpler baselines, which are closer to what a more "classical" statistical NLP solution might look like. Results on both datasets demonstrate that the neural network approaches have superior performance, with the attentional models being significantly better than the simpler Deep LSTM model. This is welcome development in the research on reasoning models based on neural networks. I've always thought it was unfortunate that the best benchmark available is based on synthetically generated cases. This work fixes this problem in a really clever way, while still being able to generate a large amount of training data. Particularly clever is the random permutation of entity markers when processing each case. Thanks to that, a system cannot simply use general statistics on words to answer questions (e.g. just from the query "The hi-tech bra that helps you beat breast X" it's obvious that "cancer" is an excellent answer). In this setup, the system is forced to exploit the content of the article, thus ensuring that the benchmark is indeed measuring the system's question-answering abilities. Since the dataset itself is an important contribution of this paper, I hope the authors release it publicly in the near future. The evaluation of the different neural architectures is also really thoroughly done. The non-neural baselines are reasonable and the comparison between the neural nets is itself interesting, bringing more evidence that the softmax weighted attentional mechanism (which has been gaining in popularity) indeed brings something over a regular LSTM approach.